Gord Downie passed away yesterday, October 17, 2017. He succumbed to his battle with brain cancer. While we all knew it was coming, death is always a shock with the finality of it. Gord will be greatly missed by a nation that he and his bandmates nearly perfectly encapsulated in their music as the Tragically Hip. As a teenager growing up and living on the Canadian Prairies, right next to the 100th meridian, Gord's lyrics about butterscotch rivers and fields of wheat, vaccination scars, open skies, water meeting the shore, strangely coloured highschool walls, the group of seven, pine trees, and canoes painted vivid images of all the parts of my life and that of many of my friends. Gord's lyrics were always underscored by the bands rhythm and guitars that often started like a slow canadian season, then quickly jumped right to mid-summer, and faded out like the last leaves giving up their grip in a late fall wind. My first connection and understanding of how important the Hip would become came at Sunfest, in Gimli Manitoba in the summer of '91. This was the year we had graduated from highschool. Most of us figured it was the last time the high school gang would be together before we all went off into the world to try out being adults. It was also the summer weekend I met up with my future wife. Their show at Sunfest was something else. The crowd at the previous year's festival was a few thousand people. However, this year the festival had the Hip and Saturday's crowd grew steadily over the course of the day reaching a peak nearing 15,000 people around 8pm in preparation. The Tragically Hip hit the stage around 9pm and they blew the sunset out of the western sky as they seared their way through tracks from Up to Here and Road Apples. Shortly into the show, someone needed medical attention near the stage. The band stopped playing and helped organize the crowd so that an ambulance could be driven through the field. The band remained calm and Gord spoke directly to the audience, telling them what was happening. Everyone at the festival helped as they could, being Canadians and all, and the band didn't get back to the set until the ambulance was out of the crowd and headed for the hospital. Then they proceeded to rip raw energy out of the cosmos and played for another 2 hours, in perfect summer weather, to a very appreciative crowd. Not a person I knew there wasn't converted into life long fans of Gord and the Hip. Later on, in 1999 I caught the Hip again at Woodstock in NY. They played an early Saturday show to a sea of Canadian flags, which where rapidly hidden away when their set finished. While the crowd was largely Canadians that had come down for the festival, the Americans in attendance that I spoke to couldn't believe they had never heard or seen these guys. It was then, at the peak of their success in Canada, that we all knew their brand of wisely crafted lyrics and carefully consutructed music was our secret. A tiny Canadian voice reaching around the world and being picked up by only a few who cared to listen. As life moved along from the 90s to now, through weddings, funerals, births and a global world that seems increasingly in need of intelligent observers, the Tragically Hip and Gord's poetry have always been a constant. They encapsulated what it means and feels like to be Canadian better than most Canadians can describe for themselves. From long drives across the country, down gravel roads to the cottage, at parties, on decks, working, relaxing, paddling, sitting on the dock in the summer or getting ready in the dressing room before hockey, the Hip have always been there. I'm going to miss knowing that there is nothing new on the horizon from Gord, but I'm also so grateful for all that he gave. Having taken the last exit, may you rest in peace Gord. The statement from his family does a far better job than I can of bringing some closure to Gord's life. In recent years there have been countless acts of terror around the world from 9/11 to suicide bombings to drone attacks in response to the latest round of extremist acts. Today, however, something different happened. Two armed gunmen attacked a satirical newspaper, Charlie Hebdo, and murdered 12 people in what can only be described as an act of insanity rather than terrorism. If you have not been following pop culture much in the past few years, Charlie Hebdo routinely lampooned all religions, including Christianity, Judaism, Islam and others. Recently there had been threats towards the newspaper because of some of the cartoons they came up with that included drawings of the Prophet Muhammed. Today, two completely misguided individuals decided it was worth their lives to take the lives of people who have been working to open the eyes of everyone around the world. As I write this, I can't think of any rational response that would make any sense. None of this makes sense. They were cartoons, meant to make people laugh, think, and feel. Little drawings meant to provoke emotion, thought, and realization that maybe things can be different. It doesn't take a strong hand to pull a trigger on an unarmed person. It doesn't take a skilled military mind to storm an office full of artists and journalists armed with pens and pencils. That is something cowards, who are afraid to look at themselves and their beliefs, do. One of the artists murdered today, Charb, was quoted recently as saying "I would rather die standing than live on my knees" when asked if they took the threats seriously. I can't think of a more rational, brave or noble stance to take in the face of irrationality such as this. All of us around the office are shocked and sad at this sensless act. Our thoughts are with the victims and the families of the injured and dead. We use Atomic Secured Linux on most of our servers to lock them down and keep out spammy content, SQL injections, and cross-site scripting attacks. It's not our only layer of security, by any means, but it's definitely one of the most powerful. It's also one of the most strict. Which sometimes causes problems. For example, Casinos of Winnipeg is one of our clients. For obvious reasons, they occasionally trigger rules meant to prevent gambling-related spam. Other clients have had problems embedding videos, since common methods of video embedding can also be used to inject cross-site scripting attacks. Managing this is largely a matter of disabling rules and/or categories of rules when they prove problematic. This can either be across all sites or on a site-by-site basis. However, since the rules in use are constantly being updated to account for the latest attacks, the side effects need to be constantly updated as well. At this point, Atomic Secured Linux is approaching the problem by creating rules for each specific type of unwanted content. Some of these rules are quite broad, and may block both clearly unwanted content and other content that's possibly permissible. The general approach reminds me of where email spam filtering was ten years ago. Prior to Paul Graham's publication of A Plan For Spam in 2002, email spam filters were similarly rule-heavy. As a consequence, they were usually either too weak, letting in large amounts of junk, or too strict, banning lots of perfectly acceptable content. Paul Graham's suggestion was to train a Bayesian classifier on email he'd already flagged as junk, as compared to email he'd left in his inbox. It worked extremely well, especially in comparison to the tools available at the time. We suspect a similar approach would work for classifying incoming HTTP requests as likely to include spam, cross-site scripting attacks, and/or SQL injection attacks. However, so far we have not found any products that make use of the Bayesian approach. We have found a few somewhat related things online. Jon Bulava wrote a proof-of-concept Apache module that would proxy web content and filter out spammy looking sites. That's close to what we'd like to have, but would work on the client side to filter content sent from another server. We'd want to look at the POST or GET data sent to the server, instead. For SQL injection protection, SQLassie is a database firewall that uses Bayesian filtering to look for malformed queries that are likely the result of SQL injection attacks. This is apparently a response to brittleness in how the GreenSQL database firewall applies it's rules. SQLassie hasn't been released as stable yet, but it's definitely worth keeping an eye on. If you've heard of an Apache module or other tool for scanning incoming HTTP requests and classifying them as either spam or a potential security threat, let us know. In the meantime, we'll keep adjusting the knobs on our security software to find the right balance between "open to attack" and "locked down too tight to do anything". Today for lunch, we made pizza. Everything turned out mostly OK. Mix together sugar, water, and salt (which I forgot) and sprinkle yeast on top and let it bloom. Dump or sift the flour into the largest bowl you have access to (or straight onto your counter if you don't mind making a mess) and make a hole in the center of the flour. Slowly add the water/yeast mixture into this well, mixing thoroughly. When the dough starts to come together, knead by hand until it's smooth. Cover the dough with a little olive oil, to keep it from sticking to everything, and leave it to rise in a warm place for 15 minutes to half an hour. You should pre-heat your oven to 500 F, so I used the counter next to the oven. Wil helpfully provided bell peppers and onions. I wanted a Margherita pizza, so I had fresh basil and slices of mozzerella. MIx it all together, bring to a boil, turn down the heat and let it simmer for 5 minutes or so. Then take it off the heat and let it cool down a bit before putting it on your pizza. We had enough dough for 5 small pizzas. It probably could have been 6. Or two medium sized. Or one really large. Bake at 500 F for 15 to 20 minutes. Or, as we discovered, for 40 minutes if you've put too many pans in the oven at once preventing hot air from getting to the top of the oven where it can properly brown your pizza. Switching the pans to different levels sped things up ... but the crusts ended up a bit tougher than I'd like. Not the best pizza I've made, but they still turned out pretty delicious. It took far too long to make this a regular thing, but cooking at work can be pretty fun. For lunch, Dwayne had brought ingredients to make a small homemade pizza in our office kitchen. Since he is a generous cook and some of the rest of us had other fixings available, we all chipped in and it became a spontaneous office lunch! So I am back from my vacation. Believe it or not this is the first time I have ever gone away for a vacation. Until now I had always thought that time off was a vacation. I now know that this is not the case. Over the last decade and a bit my "vacation" has always been free time at home by myself, and while this can be relaxing, it is not really the refreshing time off that has been described to me by others. This time however I went away! I visited my girlfriend in Toronto! I had not been to Toronto since I was 8 years old, so this was a new experience for me. And while I did the basic touristy things, I also figured out what a vacation is supposed to be. I didn't think about work. I didn't worry about phone calls and emails. I took the time to be myself and experience some of life that I don't often get to see. Now that I am back at work, i do feel refreshed and refocused. I am not feeling the pressure that sometimes gets to the point where it makes you want to snap. If you are reaching a point where you feel in danger of saying something you will regret at work, it is best to ask to take a day off or use your vacation time. I now understand why vacation time is necessary and I am glad that my bosses insist that we take the time. Visual Lizard is moving to it's new offices on Princess Street, right in the heart of the Exchange District! Unfortunately, we may not be able to answer the phones as quickly as we like as we'll have our hands full hauling boxes and computers and furniture. We apologize in advance, but remind you that you can still contact us through email. Things should be returning to a more normal state early next week. Visual Lizard joined Velocity Branding in go-karting at Speedworld's indoor track, Le Mans-like. Though most of us had never driven a go-kart before, and many of us had never really driven fast before, everyone who gave it a try had a fantastically entertaining time. Click on any of the thumbnails below to enjoy a small sampling of the high-speed fun. As you may be vaguely aware, the CRTC has ruled that it's A-OK for Bell to charge overage fees to not only it's users, but also to resellers who make use of Bell's network to connect their customers. They did back off a little bit, and mandated a 15% discount for the little guys. Not for you, of course, but for those DSL resellers. That's possibly just enough to keep the competitions' noses above water, not that it matters to the end users. Canada already had the worst deals for internet and cellular connectivity in the (first) world. Now things are even worse. Yay. However, since this has been portrayed in the media as a Bell Canada thing, you may not be aware that this affects everyone. They didn't really go to great lengths to make anyone aware of this. I just double-checked with my ISP (Shaw) and, yes, they will be charging for overuse. I was told $2.00 per GB over 100GB for my plan (Extreme), but online the number is $1.00 per GB. Not sure who to trust here (and in any case, according to some the actual cost to Shaw would be less than an penny per GB). According to customer service, in February and March I can expect a notice on how much I went over on my bill, and then in April they'll start charging. This is likely to be as much fun as per-minute phone charges. i.e. Full of inexplicable overages and sudden unexpected increases in your monthly bill. But even better, someone driving by your house can probably use your internet connection to download, well, whatever they want. So, I'm not especially confident that what I was told today by Shaw is true. But I should hopefully have a few months to hack into my neighbours' wifi figure out what my usage actually is. If you, like me, are a Shaw customer, set up an account at my.shaw.ca and check that your bandwidth usage actually starts showing up. They'll be charging you for what you use, so they'd better keep you informed. I was told the website would be relaunched (it was) and that I could find my bandwidth usage there (I haven't been able to find that yet). If you don't use Shaw, find out where to go to get a detailed account of your bandwidth usage. Get to know how much data you actually use, keep a close eye on it, and lock down your wifi. Update: Just spoke with Shaw technical support again, apparently they don't show your overage until you have gone over 2 months in a row. And, if I understand customer support correctly, they will stop showing this information if you go a month without going over. This is, to me, completely unacceptable. So I'll be harassing Shaw until I get that information. Visual Lizard turns 15 today! Visual Lizard turns 15 today!. As we turn one year older ( and hopefully a bit wiser ) we would just like to thank all our clients for allowing us to develop their Internet presence. We will continue to provide the quality of work and level of service that you expect from us. We would also like to thank all the design agencies that we work with. Our joint effort shows that clients get the best of both worlds when working with us, award winning design and unsurpassed programming. As programmers we are proud of the fact that in the past year we have helped our design partners win numerous awards. We have some exciting new projects that are about to launch so stay tuned for updates. In case you haven’t seen what we have been working on lately, here is an example of a few projects that we launched in the past year that showcase our programming skills. Visual Lizard is proud to officially announce the launch of http://www.ournellie.com for the Nellie McClung Foundation. We worked with our friends at KIK Strategy and Blindside Creative to bring it all together. The site contains a wealth of information about Nellie McClung (Wikipedia link on Nellie McClung), but more importantly, it challenges us to remember that it was not so long ago that women were not considered persons in the eyes of the law. Nellie McClung helped to change that and forever change the course of history in Canada. a special module for our Catalyst CMS to handle pull quotes, or specifically in this case, Words of Wisdom from Nellie. a tool for creating a timeline from within Catalyst. You can see the public results at http://www.ournellie.com/womens-suffrage/history-of-womens-rights. an interesting system for managing source information which comprises the archives found at http://www.ournellie.com/primary-sources. This area of the site is setup to allow it to grow to any size. a tie into our email system so that the staff at the Foundation can manage their electronic mailing list, get stats back on what they send out, and much more. I'll save the specifics for when we launch our site around the mailing system (hint: look for a future post on that). a special visual separation between the corporate site and the public site. We will let you discover that for yourself. Go exploring. As always, we very proud to have a project we have worked on go live. It has been very busy around here of late, which is odd for mid-summer, but we love it. Cheers to everyone involved~! In 1996, when we started Visual Lizard, we didn't have a web site. The Internet had just started to appear on the landscape of everyday use. In fact, at the time, there wasn't even a web host in Winnipeg that had a working server, but that is a different story. One of our first tasks after opening the doors, was to put up a web page no matter the effort. We worked on and learned about the web as we went. We built a site in good old HTML 3.2. Since 1996, we have had 7 official versions of VisualLizard.com. For our upcoming VisualLizard.com version 8, we decided that we needed to get some proper team and staff shots done. Photography is important in helping convey our personality and who we are to our clients. In the past, we have been using pictures of the team that were taken at random intervals over a couple of years. They where alright, but the new site needs to take things up a level. We needed proper lighting, uniform focus, retouching of our ugliness, and, most importantly, someone who could hold a camera properly. Of course we turned to our long-time collaborator in Jerry Grajewski. Coincidentally we had just launched GrajewskiFotograph.com. Our 1.5 hour photo shoot with Jerry was a ton of fun. We had some laughs. We all posed like the super models we are. We broke one of Jerry's lights. Well, we didn't break it directly. It died while trying to make Max visible. After all of that, we now have a great set of staff photos and an awesome team photo. The team photo is posted below to give you an idea of where our staff page on the new site is going to go. It should also give you an idea of what sort of wizard Jerry is, since we all look great. Thanks Jerry! It was back in the fall of '08 when our good friends over at Guppy Design asked us to help out with a project for their landlords. 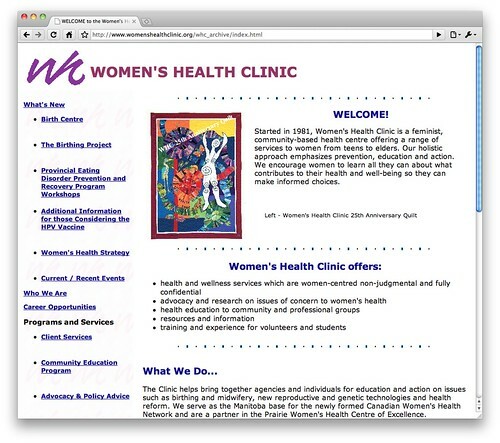 The Women’s Health Clinic site needed a makeover so we said sure and jumped in. 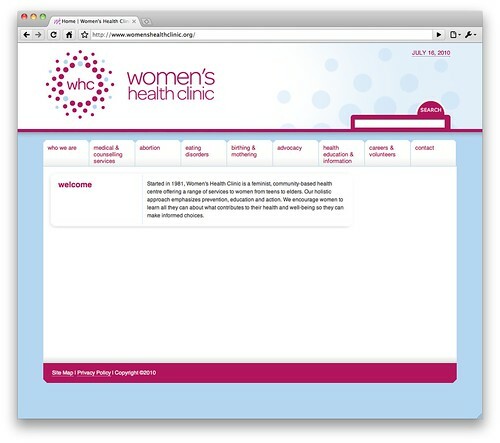 Working with Guppy and the crew at the Women’s Health Clinic (WHC), we built a new site on our Catalyst Content Management system. The staff of WHC has full control of the content within the site. They can also set their titles, keywords and descriptions to help optimize the indexing of the site in search engines. At launch, the site is built to valid web standards for XHTML Strict 1.0 and CSS2. Congratulations to all involved and we will be watching for good things to come. During those summer hours, we are going to be doing a little bit of exploring. The first stop on our Recharge Tour 2010 is an extended Canada Day. We are going to be closed on July 1st through July 4th this year so that we can enjoy an extra day with our families and friends. We encourage you to do the same! and a few more which we haven’t decided on yet. Never fear though, we will still be working as hard as always on your projects. There will be code written, logic tested, web standards adhered to and sites launched. Of course we will make sure that you are aware of any specific dates when people involved in your project are out of the office. We look forward to seeing your pictures when we all get back in September. Keep those cameras handy and have fun! On Wednesday afternoon, Valve Software officially released Steam, their video game launch platform and online store, for Mac. Steam had been a service exclusively for PC users since launched it in 2004. This year, however, Valve has not only ported it over to the Mac, but given it a visual refresh! The Steam client downloads as a DMG file, and installs fairly easily, though, as John Gruber discovered, there were some odd decisions in the build. All the elements of the PC version are here, such as the built-in Steam Community. A new feature with this launch, however, is Steam Play, which allows customers to purchase a game once and play it on all Steam supported platforms. Gamers who have previously purchased games on Steam will find them available in their account on the Mac as they are released. One of the best features of this launch is that Valve is allowing any Steam user to download Portal for free until May 24th! Powered by Valve’s Source Engine, this FPS puzzle game has earned critical praise and won several game-of-the-year awards, and is well worth trying out. Naturally, giving away this game only adds to the anticipation for it’s upcoming sequel. Kyleigh woke me up this morning with "Happy EARTH DAY!" and a song about earth. It was pretty cool actually, even though it was 6am. So to honour that childhood enthusiasm, we are going to assemble the Visual Lizard BEST of Earthday right here. Head on over to http://www.earthday.org/ and jump in. They have several initiatives going on right now. Post your Act of Green on their homepage, sign the responsible climate declaration, and check out the Earth Day 2010 campaign. We eat a bit of sushi around here. This is a supper handy guide we use to try and keep our sushi habit as green as possible. Thanks Earth Defense Fund! This site is an awesome idea that is starting to happen. While not directly an Earth Day initiative, the site is attempting to map every tree in San Francisco. Every single tree! The best part about the site is that it is user driven and leans heavily on Google Maps to do handle the heavy lifting. Hopefully their beta opens to the public soon and we can start mapping our awesome urban forest here in Winnipeg. What a great look back in time. Awesome. Do your part for the planet. It is the only one we have. 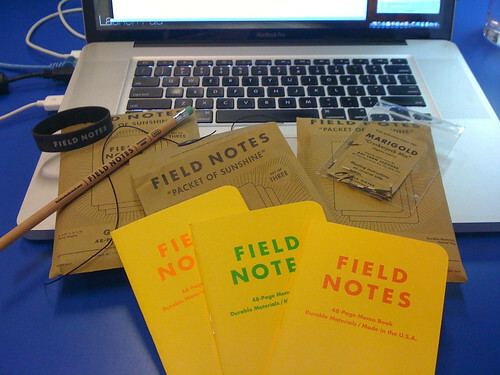 I freely admit that I have an unhealthy addiction to FieldNotes notebooks. Something about them makes me feel smarter when I use them. Maybe it is the fact that I fill up pages so quickly because of the small size? At any rate, I now have a rather large collection of filled notebooks. The problem with taking notes on paper, is that I have found it really hard to search via Spotlight and find anything I have written down. Damn analog vs digital. Additionally, I’ve been hot and cold on Evernote for a couple of years now. The entire concept of dumping everything into one bucket and then searching over it seemed so alien to me after 12 years of keeping thousands of folders, with nested files, all neatly organized. It was only with QuickSilver, and then later Spotlight in OS X 10.6, that I realized how much time I was spending organizing stuff on my computer. I was wasting time just filing things. Spotlight’s running indexes work well enough to let me forget about my need to file things. However, I still have the problem of not being able to search paper. All those thoughts written down and immediately forgotten. Then a few days or weeks later someone calls and you know you had some information written down someplace, but where? A little googling turned up a few posts about sending notes to Evernote and leaning on the OCR abilities there. Fill up a notebook and hook up the scanner. Create a scan folder for your files. I went with FN-VolNumber as the parent folder. Open up Automator and follow Ken’s automator evernote write up on making an automated task.Thanks Ken! TIP: Make sure to include 0 before all the single digit spreads. Rinse and repeat as often as needed. That is it. Evernote’s OCR is working on indexing several notebooks as you read this. Results have been hit and miss with my hand writing, but if you remember to print really important bits, the OCR works well. Of note: handwriting is important; printing works better than cursive; pen ink wins over pencil grey; images are being captured as high quality JPGs with 150dpi resolution; I’m on the free Evernote account for now; having the Evernote iPhone app means my FieldNotes are always with me. The best newspaper cover in Canada this morning. Translated - King of the Games. What a great hockey game. Interesting stuff that is pretty much inline with my experiences. To comment, please visit the original article at the Focus site.